Pure comfort for you and your patients. Patient comfort is paramount in reducing anxiety. 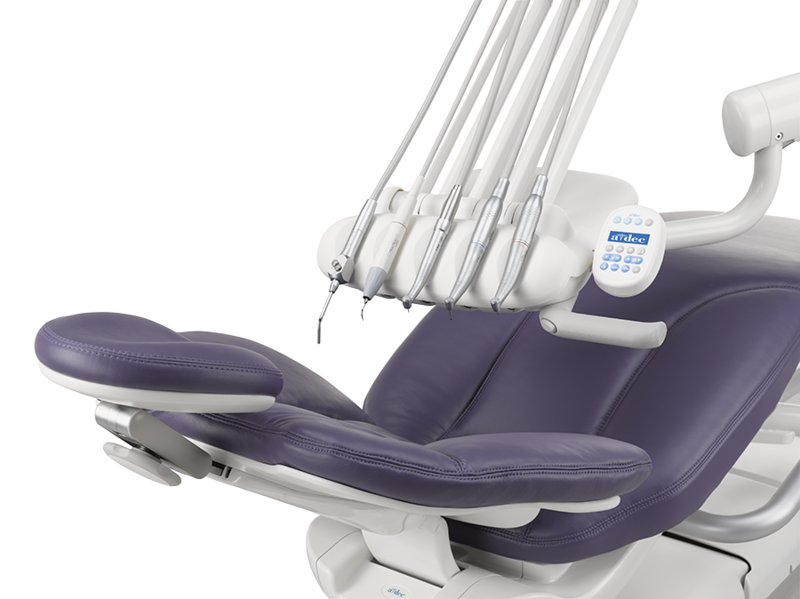 The A-dec 400 dental chair design helps put your patients at ease. The key to productivity and career longevity is remaining comfortable while you work. This is why A-dec 400 is designed to keep your movement fluid and ergonomically aligned. Ergonomic delivery system options. The A-dec 400 dental chair and A-dec 300 delivery system offer the perfect combination of compact maneuverability, access, and style. The A-dec 300 Traditional delivery system and the A-dec 300 Continental delivery system position your handpieces and ancillaries at your fingertips, eliminating unnecessary movement while keeping you focused. Left-right versatility for added productivity. 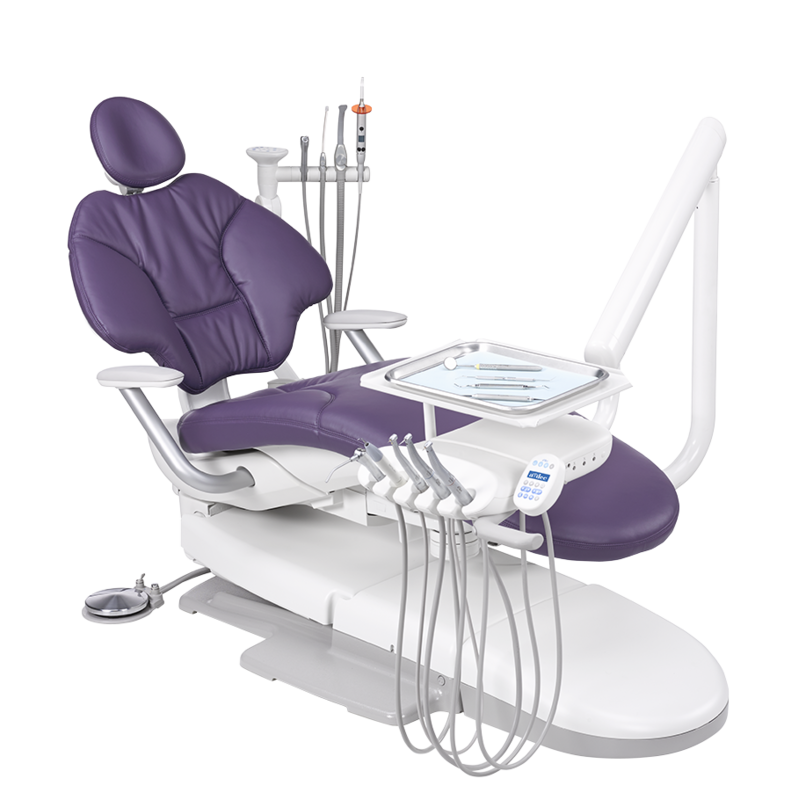 The Radius-style delivery systems, cuspidor, and A-dec 500 assistant’s instrumentation quickly and easily rotate around the chair for complete left/right compatibility. Available in Seamless or Sewn upholstery (Sewn pictured). Delivery system styles: Radius-style system. Rotates around the front of the chair so it’s easy to switch between right- or left-handed operators. Mounts on A-dec 300 or A-dec 500 dental chairs. Self-contained waterline maintenance system. Includes a 2-liter water bottle, an innovative control block, AlphaSan tubing, and the revolutionary ICX waterline treatment tablet for worry-free waterline maintenance. Balanced flexarm with airbrake. Provides easy positioning and total stability. Wet/dry foot control. Operates handpieces and integrated accessories in conjunction with the A-dec 300 deluxe touchpad. 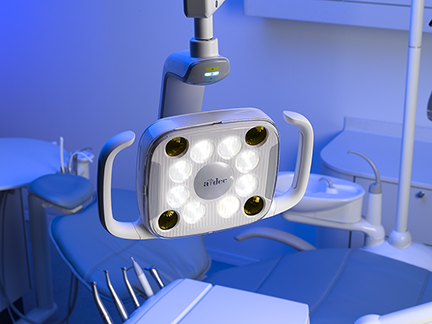 The A-dec 400 is available with either halogen or the latest LED light. Both available as either chair mounted, wall or ceiling mounted. The A-dec 400 has a great range of options available, such as built in devices like micromotors, scalers cameras. 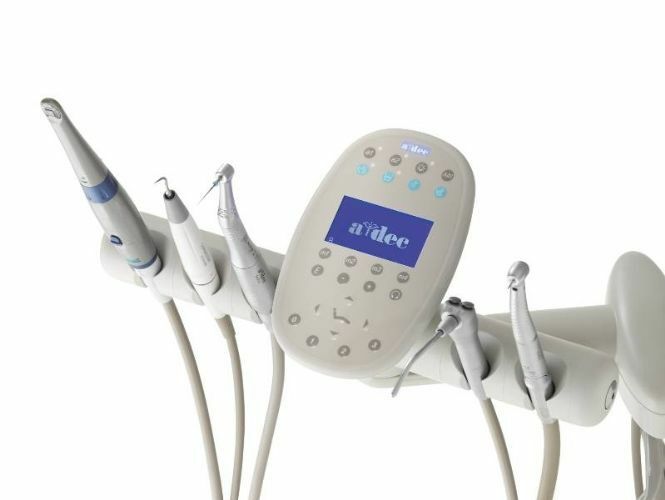 The A-dec 500 has a great range of options available, such as built in devices like micromotors, scalers cameras. Click here to see a range of A-dec upholstery colours To discuss the complete range of options and configurations available for this chair please contact us on the details above or email us.